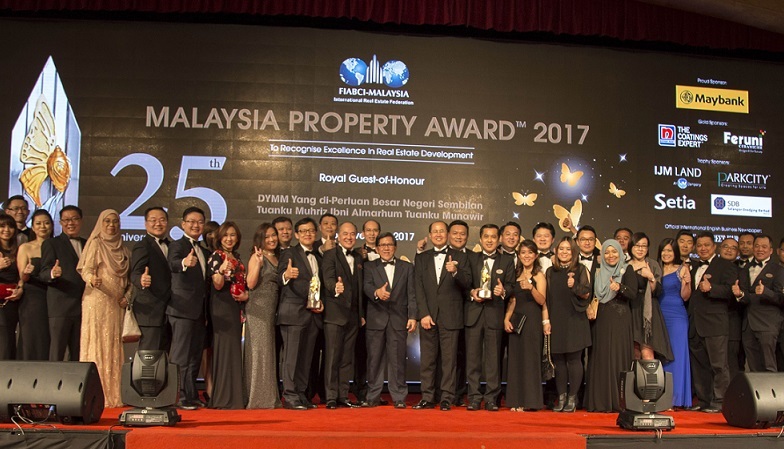 There was double success for SP Setia at the recent Malaysia Property Award 2017, with two awards going their way – the Affordable Housing award and the much-coveted Master Plan Gold award. Organised by FIABCI-Malaysia, the glitzy award gala ceremony offers recognition to outstanding Malaysian developers and their projects, judged by a sterling panel of renowned industry experts. SP Setia’s Seri Kasturi Apartment in Bandar Setia Alam won in the Affordable Housing category, while Setia Eco Glades in Cyberjaya took home the Master Plan Gold award. President and chief executive officer of SP Setia Dato’ Khor Chap Jen said the company was “absolutely delighted” to be chosen as winners in two distinct categories, showcasing that SP Setia was indeed multi-disciplinary property developer. From Left : Farouk Mahmood (FIABCI World President), YM Tengku Dato’ Ab Aziz Tengku Mahmud (President, FIABCI Malaysia), DYMM Yang diPertuan Besar Negeri Sembilan Tuanku Muhriz Ibni Almarhum Tuanku Munawir, Datuk Koe Peng Kang (Executive Vice President of S P Setia), Sr. Teh Teik Bin (Organising Chairman), Mohd Zaini bin Aris (Head of Corporate Finance Maybank). “Our strategy of focusing on the principle of continuous excellence and exemplifying our vision to be the best in all we do imbued with our LiveLearnWorkPlay development philosophy has enabled us to continue to achieve greater heights this year,” he said. Executive vice president of SP Setia Datuk Koe Peng Kang, who accepted the award for Setia Eco Glades said the development was the embodiment of S P Setia’s unique expertise, which combines residential luxury with eco-consciousness. “Setia Eco Glades is a superbly designed collection of thematically different islands inspired by cultural diversity and perfected by nature and technology. We are very proud of our win here at the Malaysia Property Award 2017, and we dedicate this win to Team Setia who have diligently worked hard to make Setia a trusted brand in the property industry,” Koe said. Receiving the Affordable Housing award for Seri Kasturi Apartment, SP Setia executive VP Datuk Tan Hon Lim said the Setia brand is synonymous with strength, reliability and the value creation that it brings to all its developments. “We are proud to be able to deliver high quality homes while still maintaining its affordability for the home purchasers,” said Tan. All smiles from team SP Setia. Winners of the Malaysia Property Award will automatically earn a ticket to the FIABCI World Prix d’Excellence Awards to compete against a global array of properties. 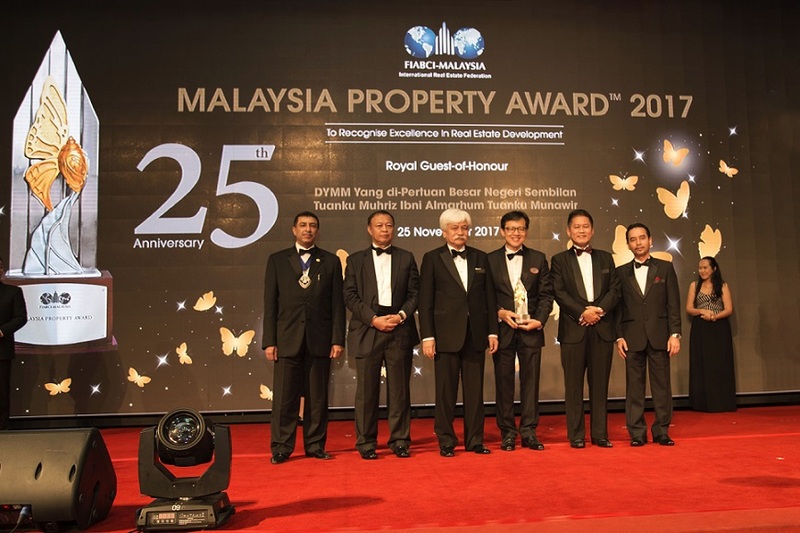 Both the Malaysia Property Award and FIABCI World Prix d’Excellence Awards are hailed as the “Oscars” of the real estate industry and a champion architectural excellence. To date, SP Setia is the only Malaysian developer to have received seven FIABCI Prix d’Excellence Awards in the property industry.